Efforts by the companies that dominate public discourse–Google, Facebook, Twitter and YouTube–to privilege the Left at the expense of conservatives have been in the news for a while. I was one of 63 conservatives who signed a letter to social media companies including Facebook, Twitter and YouTube, calling for transparency, equal treatment, and free speech. Not that I expect it to do much good. 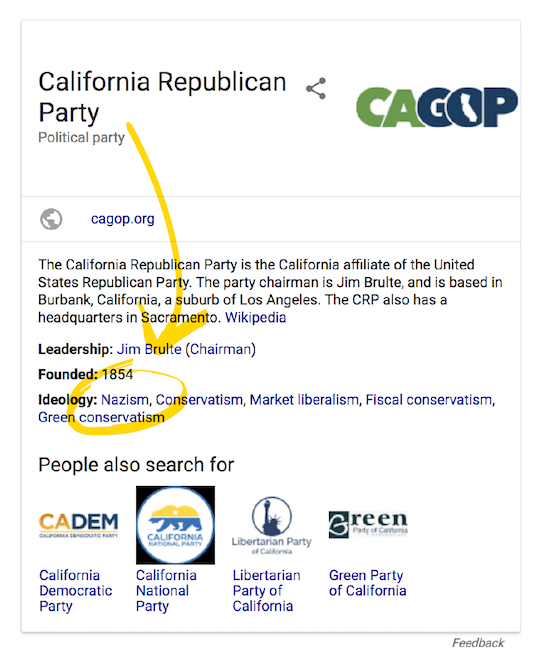 Less than one week before the California primary, Google listed “Nazism” as the ideology of the California Republican Party. This is similar to the occasion when Google instituted discriminatory “fact checks” that showed up when people searched on the names of conservative media outlets like the Daily Caller. I wrote about that here. “Nazism” presumably was the childish act of a junior Google employee. Maybe he is about to leave Google, or maybe he thinks his superiors will applaud what he did. It will be interesting to see how Google follows up. The “Nazism” reference was removed after a complaint. As on so many prior occasions, one wonders whether the Department of Justice’s Antitrust Division is preparing some action against the left-wing internet oligarchs. If so, they had better get cracking. If our next president is a Democrat, such childish games as we saw today are likely to be institutionalized and rewarded.